Step 2 In a medium bowl, whisk together the egg white, vanilla extract and water. Step 3 In a zip-top bag, add the powdered sugar and cocoa powder. Seal the bag and shake it around to get everything incorporated. Step 4 Add 1 cup of almonds to the egg whites and use a slotted spoon or fork (or nature’s fork–your hands) to coat all the almonds. Then using your “fork” put all the almonds in the cocoa/sugar zip-top bag. Seal it well and shake it around to coat all the almonds. Step 5 Place the almonds on a baking sheet.Repeat the egg white and cocoa steps above with the other cup of almonds. Don’t worry if you get the cocoa powder on the baking sheet–it won’t do any harm. Step 6 Bake for about 20 minutes. Step 7 If you’d like them a bit sweeter, you can add the cooled, roasted almonds to a zip-top bag along with a few tablespoons of powdered sugar and toss them around. Step 8 Keep the almonds stored in a zip-top bag. 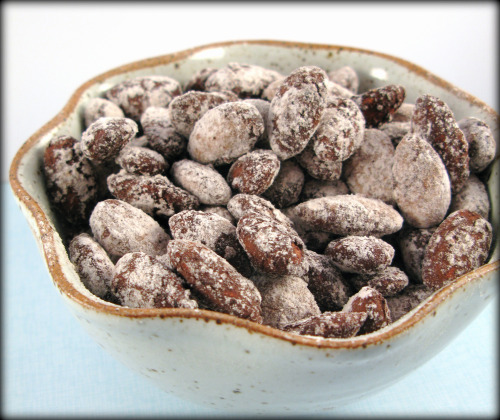 Who doesn’t like Emerald Cocoa Roast Almonds? Maybe you haven’t read the nutrition label, maybe you have. Let me inform you these babies are sweetened with sucralose–the ambiguous name for Splenda. Like we posted on Crash Course on Sugar, Splenda is a calorie-free sweetener BECAUSE we cannot digest it–read diarrhea and the likes. So yes, we’ve added sugar to this recipe. But please understand these are not overwhelmingly sweet, in fact, I think the sweetness is quite subtle and find the cocoa “crust” on the outside of the almonds to be the most addictive part of this snack—not the sweetness. Also–this is a great recipe for your kiddies to help out with!